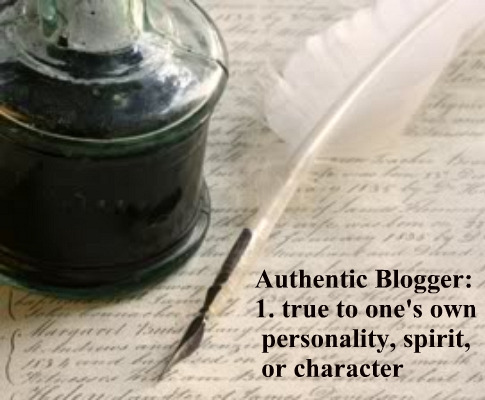 I am happy to report that a close friend and I have just created a new Facebook group called Authentic Blogger. This is a community we have established for all bloggers, worldwide, to have an open forum for discussion, sharing information and tips on promotion, marketing and building awareness of each individul blog site. In order to create continuity and duplicate our concept in the blogging world, we have created this blog site by the same name. We will stay true to the personality of our Facebook group by creating blog posts that offer helpful blogging tips, promotional ideas, expound on topics that we both embrace, with the goal of creating a complementary loop of information. Our Mission Statement is simple - we want our name, Authentic Blogger, to say it all. Write, create and promote topics in your blog that resonate strongly with you. Follow blogs that speak to you personally and interest you. Do not cave in to the mindless "if you follow me, I'll follow you" concept that is rampant in the blogging world. Support your fellow bloggers/writers/artists by posting sincere, thoughtful comments on their blog site when a specific post truly captures your attention and imagination. We hope to grow our community to a global level with lively, exciting interaction taking place on our Facebook wall and discussion boards. We anticipate that we will grow and change over time, and we look forward to that growth process. We welcome suggestions from all our future readers and hope that our group will provide you with hours of enjoyment. Please take a moment to visit our group page. If you're a blogger, please join our group and then post your site's URL on our wall. We hope you will also take time to tell all your blogger friends about us. Helping us to grow awareness and membership with our group will also help every member to garner attention and interest for their unique blog site. This is an exciting new venture for us and we believe that there are no boundaries or limits with this concept. Both Marty (my partner and fellow officer) and I will work hard to make this a unique, worthwhile group for all bloggers, writers, artists and creative people in general to participate in. We hope to see you there!